Welcome to the EQ-Wine Covers® Company web site! We are proud to offer a full line of metal buildings: Pasture Shelters, Hay Covers, Mare Motels, Carports, R.V. Covers, Crush Pad Covers, Ag Buildings, Barns and much more! Delivery is available throughout California. Call us for pricing to your door! We are happy to provide the most cost effective, easy to install metal structures available anywhere. We hope you enjoy your visit to our site. All of our products feature sturdy made in the USA Galvanized Steel components, optional painted roofing, and come as complete kits. You will receive all the necessary fasteners, complete instructions, high quality 4"x4" galvanized steel posts, purlins (cross beams), and high "box rib" roof decking. We can work with you to design an affordable, and easy to install kit. Our modular products allow you to customize any size kit. Keep your vehicles covered, or your animals happy! We are based in Paso Robles, California, and we deliver aywhere in California. You can will-call your order, or arrange for shipment to your door. All prices quoted here are plus CA sales tax and delivery (if applicable) on our trucks. All photos on this web site were taken of EQ-Wine Covers Co. projects, and are subject to copyrights. EQ-Wine Covers is a Trademarked name, with all rights reserved, 2000-2019. One of our best selling shelters is pictured above. 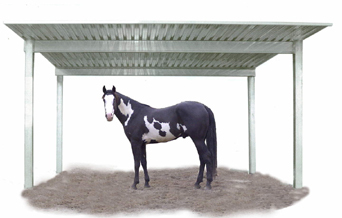 This is the 18'x18' Classic Cover four post Pasture Shelter, which is now just $995. Our kits features 4"x4" galvanized steel posts (in your choice of gauges from regular (16ga. ), heavy (13ga. ), high box rib roofing, all fasteners, trim, and detailed instructions. "Four post" 18' x 18' kits are wind rated to 85 mph winds. "Six post" kits have a 100 mph wind rating. All prices are plus tax and delivery, if applicable. horses, hay, or 3 car parking, now just $1595!!! Be ready for the coming weather with an EQ-Wine Cover! South of the Mid State Fairgrounds. and much more. Call for details, and let's get started!